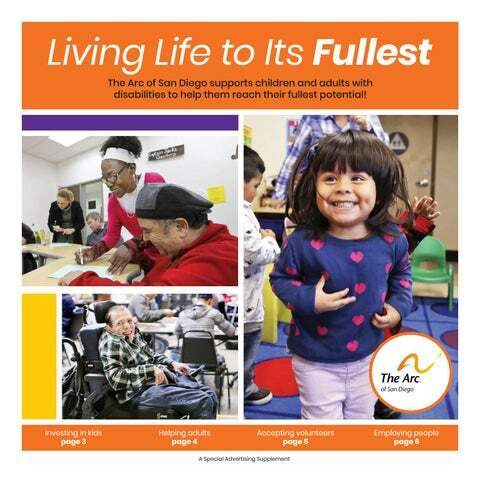 Living Life to Its Fullest The Arc of San Diego supports children and adults with disabilities to help them reach their fullest potential! are located throughout San Diego County with programs also offered at other locations through various community organizations. with intellectual and developmental disabilities receive services and support from The Arc of San Diego. work for The Arc, which is also one of the area’s largest employers of people with intellectual and developmental disabilities. was earned by clients of The Arc in 2018 through its employment programs and services. 3 WAYS TO SUPPORT KIDS Get help Option 1: Receive in-home visits from The Arc for one-on-one advice and care. Option 2: Go to one of The Arc’s centers for a classroom setting and assistance with social, motor and communication skills. Option 3: Attend toddler group events in community spaces for other supplemental activities and socialization. Give help Option 1: Volunteer to work with children in a classroom at one of The Arc’s centers. Option 2: Donate items to The Arc’s Early Intervention Services, such as toys or books. Option 3: Fund grants for art and music therapy. “We provide personnel who are trained to work not only in the espite the well-documented health benefits of exercise, fitness field, but in providing support to people with disabilities. nearly half of adults with disabilities report engaging We also provide an environment that’s welcoming for everyone in little to no physical activities, according to the Centers for Disease Control and Prevention. This is often due to to be a part of.” Our Place also provides people with the chance to socialize. inaccessible facilities and lack of fitness professionals who have Clients can express themselves through fitness and other experience working with individuals with disabilities. But at The Arc’s Our Place Wellness Center, people of all abilities can therapeutic programs and make friends. “It’s a good opportunity to meet people … and maintain find affordable and accessible fitness and wellness programs. friendships that you’ve made through the years,” Ben Samuel, who has cerebral palsy and uses a says Samuel, a classic rock fan who likes to wheelchair, has been a member of Our Place participate in the music program when he’s for almost three years. He had access to not working out. “It’s a great opportunity occupational therapy through California to expand your social network.” Children’s Services when he was Our Place also provides younger, but once he aged out of the enrichment through the Personal and program he had to find new ways Leisure Services (PALS) program. to keep fit. At Our Place, he lifts Through local excursions and other weights, takes yoga classes and activities supported by qualified uses wheelchair accessible fitness staff and volunteers, clients equipment. BEN SAMUEL learn social, personal safety and “I like exercising and being on Client, The Arc of San Diego independent living skills. the move,” he says. “It’s kept up … “Our clients need opportunities to my drive to keep myself healthy since get out and explore the world, explore I have a disability. It’s given me strength. the city, their community and environment It’s helped out a lot.” and make new friends,” Umpierre says. “If According to Justin Umpierre, Director they don’t have them, they’re at home, watching TV. of Community Living Services, all of Our Place’s There’s so much more of the world that they can explore by programs and classes are adaptive to any type of disability. Just being a part of these programs.” as importantly, the program is affordable: $25 for Arc members and $45 for non-members for a seven-week program. “Most clients can’t go to a gym because there are very few pieces of equipment that they can access,” Umpierre says. 3 WAYS TO HELP WELLNESS Get active Option 1: Join an exercise program at The Arc’s Our Place Wellness Center, no matter your fitness level. Option 2: Learn how to cook healthy meals with a registered dietician or go on a Personal and Leisure Services (PALS) excursion. Option 3: Visit www.arc-sd.com/ourplace to learn about programs and services that can benefit your unique needs! Give support Option 1: See what kind of equipment and materials The Arc needs at www.arc-sd.com/ wish-list. Option 2: Volunteer your time and expertise as an exercise guide or chaperone a Personal and Leisure Services (PALS) activity. Option 3: Donate a one-time gift, become a member or name The Arc as a beneficiary in your will by visiting www.arc-sd.com/donate. 3 WAYS TO HELP WITH JOBS Get a job Option 1: Enroll in The Arc’s employment placement program for help with career goals, applications, interviews and more. Option 2: Work a fixed amount of hours each week through the group-supported employment program in food service, landscaping, retail and more. Option 3: Help businesses with their basic assembly and packaging needs at one of The Arc’s production centers. Hire for a job Option 1: Be connected with reliable candidates who can perform repetitive tasks or fill positions with high-turnover rates. Job coaches can also be provided at no cost to employers. Option 2: Contract with The Arc’s Employment Services to meet your service or production needs, on- or off-site. Option 3: Get more information on how to fill a position and visit www.arc-sd.com/ community-employment-services or call 619-685-1175. Apply online by visiting arc-sd.com/volunteer-forms or in person at The Arc’s main office. Go on an onsite tour to meet staff and make sure volunteering for The Arc is a good fit. Pass standard screening tests required to keep The Arc’s clients safe. Complete orientation and any onsite training with staff. INVEST IN THE ARC: IT MAKES GOOD SENSE! Investing in and supporting organizations like The Arc benefits more than just individuals with disabilities and their families. It benefits the whole community! Early intervention services can integrate young children into mainstream classrooms rather than into segregated special education programs or expensive state-run institutions. Employment programs help many people transition from needing government assistance to becoming taxpayers, decreasing spending for entitlement programs. Nearly $6 million was earned by clients employed through one of The Arc’s programs in 2018, much of which went back into the local economy. he Arc of San Diego supports people with disabilities through the right assistance and resources, but it needs your help to continue doing so. To keep providing crucial programs and a unique continuum of care, The Arc needs everyone to get involved and create a more inclusive community. From donating to volunteering, there’s so much that can be done by reaching out and supporting The Arc! Seeking services and support? Visit arc-sd.com/seekingservices. Able to lend monetary support? Learn more and donate to The Arc at arc-sd.com/support. Have needs to fill at your business? 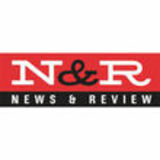 Get information at arc-sd.com/business-services. More programs and services offered at additional locations countywide, visit www.arc-sd.com for more information.